Injured Spurs Pau Gasol and Rudy Gay will miss Wednesday's game at Miami. Next Spurs home game: vs. Houston Rockets, Saturday, 7:30 p.m.
Spurs' injury/inactive report: Guard Derrick White (left heel pain), probable; forward/center Pau Gasol (right foot soreness), out; forward Rudy Gay (right heel soreness), out; guard Lonnie Walker IV (right medial meniscus), out; guard Dejounte Murray (right ACL), out. Also unavailable: Forward Drew Eubanks, assigned to Spurs' G league team in Austin. Heat's injury/inactive report: Guard Dwyane Wade (personal reasons), out; guard Goran Dragic (right knee), questionable. Notable: All-NBA Spurs forward LaMarcus Aldridge has 200 career games with 20+ points and 10+ rebounds. There are only five players with more 20/10 games since Aldridge was drafted in 2006 -- Dwight Howard, DeMarcus Cousins, Zach Randolph, Kevin Love and LeBron James . . . Since the beginning of the 1997-98 season, Tim Duncan's rookie year, the Spurs have had a losing record for only 48 days of the last 20-plus years . . . After Wednesday's game, the Spurs won't play again until Saturday night when they host the Houston Rockets. The game will be broadcast by KENS 5, the official TV station of the San Antonio Spurs. The silver lining for the Spurs after their 117-110 loss to the Orlando Magic on Sunday was that they mounted a furious rally after falling behind by 26 points with 9:02 left. The bad news? The Silver and Black’s defense was virtually nonexistent for most of the other 39 minutes. After holding each of their previous two opponents to under 100 points in victories, the Spurs reverted to the sieve-like defense that was the culprit in double-digit losses to Portland (121-108) and Indiana (116-96). San Antonio fell to Portland on the road, but the 20-point setback to Indiana came at the AT&T Center. Trailing the Magic 105-79, the Spurs went on a 29-8 run that closed the gap to 113-108 on a three-pointer by Pau Gasol with 1:41 remaining. But the Magic refused to fold and hung on for the victory. "Well, the best part of the night was that we kept plugging away," Spurs coach Gregg Popovich said. "We didn't play very well, but we kept plugging away and gave it a run. And that's good. They've got good character. But the worst part of the night was our defense was really poor. I think that they (Magic) deserve a lot of credit. They were really efficient offensively. "They haven't been all year. They've been at the bottom of the league in offensive efficiency, and a lot of it is because it's a new system and Coach (Steve) Clifford is getting them going. They're getting better all the time and tonight they really clicked, and we guarded very poorly. That was our demise." The Magic shot 57 percent (24-42) in the first two quarters and led 63-54 at halftime. They cooled off slightly in the third quarter, shooting 50 percent (11-22), but still led by 17 (91-74) heading into the final quarter. “They went out there and played well,” Spurs guard DeMar DeRozan said of the Magic. “We made a lot of mistakes defensively, not being able to make things tougher on their scorers, their shooters. 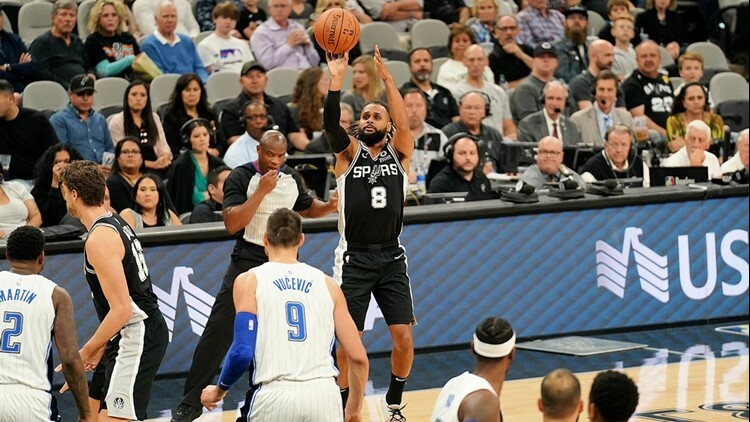 San Antonio held Orlando to 40.7 percent shooting (11/27) in the fourth quarter and hit 57 percent (12-21) of its field-goal attempts in the period. The Spurs got hot from the three-point line, nailing 5 of 9 (55.6 percent) shots. But in the end, it was too little, too late for the Silver and Black. The Spurs (6-3) will try to get back on track defensively Wednesday night when they play the Heat (4-5) in Miami. San Antonio had won four straight before falling to the Magic. The Silver and Black will play without Gasol (right foot soreness) and forward Rudy Gay (right heel soreness). Spurs forward LaMarcus Aldridge liked the way the team rallied in the fourth quarter. “We don’t ever quit,” he said. “I thought we definitely played better defense in that stretch to cut it to five. I thought we communicated better, but they made tough shots. I thought down the stretch we guarded better. After facing the Heat, the Spurs won’t play again until they host the Houston Rockets on Saturday. The game, scheduled for a 7:30 p.m. tipoff, will be broadcast by KENS 5, the official TV station of the San Antonio Spurs.